Greece - Rhodes - Blog from Rhodes, Greece | Margaret in Wonderlands..
Our last hot holiday of 2016 was to Rhodes in Greece, we went on the 17th September. I did my 3 classes in the morning and we left about 12.40 and it took just under 2 hours to get to the parking space which was on the driveway of a big house in the country near Gatwick. We were greeted by the two guard dogs and they were more friendly then scary. We waited for our taxi and it had been given the instruction of picking up 50m from the Russ Hill Hotel. After waiting for 5 mins or so we called it, it came 15 mins late. It had been sat in the wrong place which was a bit of a stressy start to the holiday. It was about 10-15 minutes to the airport and cost £8. The parking space had cost about £27. When we got to the Thomas Cook check in desk, there was quite a big queue for the baggage drop and only 2 people dealing with people. One was dealing with VIP (so anyone who paid the extra, I think it was £17.50 each) It was so frustrating as the normal check in actually moved quicker and when two slow desk attendants got on the desks, they sat talking for ages and one served the check in people rather than the baggage drop queue. When we got to the desk, the lady said something to the other women and she told her to call up, Rich started to get really annoyed as it was an hour before the flight was due to take off but we had waited a good 50 minutes trying to drop our damn bag off and I was starving by then (as I hadn't eaten all morning). She got off the phone and started processing the bag and I said to her how long we had been waiting and how slow and bad the service was. She didn't seem that bothered or fazed by it, good service Thomas Cook! We got through security quite quickly and went and grabbed a Pret sandwich and had to go straight to the gate. The flight was about 4 hours and we got a meal deal on the plane, I had the Thai chicken curry which wasn't great. The plane was really small and Rich was in the middle and I was on the aisle, the guy in the window seat spread out so Rich wasn't very comfortable. Upon arriving we were lucky that at least our bags came off first. We made our way to the coach and sat in it waiting for the last stragglers which were about 30 mins after we arrived. We were the first drop off which was great and we got to the hotel about 11ish. They took our passports and kept them for the time we were there. When we got to our room, we had a little bedroom, kitchenette, living room area and a bathroom. There was no AC, you could pay extra for that though. After settling in we hit the deck for an early start in the morning. On the Sunday we headed down for breakfast, it was served out the front of the hotel in a big room with an outdoor section. They had ham, cheese, salads, breads, beans, mushrooms, sausage and eggs. It was pretty standard but the bread was always fresh and lovely! We got to the pool around 9.20 and there were no sun loungers bar one. I grabbed it and Rich went to look for another. All the chairs had towels on but there was probably only about 7 people around which was really annoying. Rich saw an older man sitting on a blue sun lounger on the grass area, reading the daily mail and he gave his too Rich as he was going to meet his wife by the front pool. After a while a few people came and took one lounger and left one so Rich swapped his with that one. We actually ended up being sat in the best place by the pool for the sunlight. We were near the shallower pool and a really tiny pool, there was a deep one further up which had a section in the middle for DJ and music. We were sat near 4 older people, one of them was a lookalike for Ed - my father in law (it was uncanny) We only had half board so for lunch we went to the shop at the front of the hotel and picked up some bread, ham, cheese crisps and cookies which cost about 25 euros, it was expensive but they could charge it as there was nothing else around. We went back to our room and made up sandwiches with a side of crisps and cookies. Later for dinner there was a massive buffet which was the standard every night. I had carrot soup, white fish, moussaka, salads and some dessert. Rich found they did an outdoor BBQ area where they were doing burgers. After dinner we went for a walk down the road to check out the local area. There wasn't much about, we walked to the left and saw a fish restaurant and further along two Chinese restaurants. There was also a pack of dogs, 5 of them walking in the middle of the road and weren't budging even when being beeped. We then headed in the other direction and there were a few restaurants but not much else so headed back to the hotel. We went to the bar near the front and I ordered a strawberry martini, which our bartender made all fancy with extras and a sparkler. Rich had a Mythos beer, it cost 10 euros with a tip. My drink was super strong so I left a little bit as couldn't finish it and it wasn't the nicest. After that we went to wander around the hotel. Sunday was the night off for entertainment so we went to bed as the only English TV channel in our room was BBC news and we had no Wifi, this is sometimes a good thing as you can switch off totally from everything. On Monday, we had another pool day. We sat in the same spot again beside our older gang. The hotel entertainment team did stretching exercises first thing, then bowls, then water aerobics. The Ed lookalike was very active and did the water aerobics on the side lines. It made me giggle as he really did look like Ed. We went off and had a sandwich in the apartment, we then went and got an ice-cream. I had a magnum almond which was a bit like a cornetto shape and very tasty. The entertainment team had a few hours off and then did water polo, darts, more bowls and volley ball in the afternoon. They also tried to sell these bright t-shirts with the Animation name on it. We weren't really interested in doing activities and the team keep saying 'maybe tomorrow' when they asked us to do stuff. I had my kindle and Rich had a few books so we just really wanted to chill, sunbathe, swim and eat. They played music throughout the day but by the end it was repeated loads (standard abroad stuff). For dinner it was BBQ pork and pasta and all the usual stuff indoors. Later on, the entertainment started. There was an outdoor area with a stage and seats where they held activities in the evenings. Apart from a couple of nights when they did it in the bar area within the hotel. Our room was near the outdoor entertainment so it was loud but they did finish up around 11 most nights. They did Bingo and guess the song which we did from our hotel room and I actually got most of them. They did some songs where you had to guess the film they were from. It was good fun! We left the doors open to get some air in and that proved to be a bad mistake as we got eaten alive that night! It was also incredibly hot that night so was quite an uncomfortable one. On Tuesday we woke to a rainy morning. We went for breakfast and the wild dogs were back. One sadly had a limp and another one was trying to hump a smaller dog, poor love! We decided to go to Rhodes Old Town to walk around as there wasn't much else to do. We waited to the bus and a lot of people had the same idea. The bus took about 30 mins or so and was very full. We went inside the historical city and walked around the edge. There was a tall church like building that was pretty and there was lots of cobbly little lanes with shops in them. We picked up two magnets for 2 euros for ourselves and Belinda. After an hour or so we went for a sit down and for something to eat in a restaurant which had a rooftop terrace. It was nice and you could see over to the sea and big cruise liners that had docked. We ordered some dolmades and chips. They brought some extra bread as well and it was all delicious. We walked through the centre of the old town and there was a pretty fountain there and we walked up some steps to take some pics from above of the busy little area. It was a nice day exploring the pretty little town. It started to rain as we went towards the port area so we hid under a tree for a bit. We then went to walk into an area within the old town grounds and there were some African women trying to stop people to look at something but we ignored them and guessed it was a scam of some kind. It was really starting to rain so we headed back to the bus stop to go back to the hotel. We went and got water and went back to the room and we read for an hour. The rain stopped and we went for a walk to the beach nearby, on route we saw some slides which weren't in use and we continued on to the beach which were very pebbled and dark sands, it wasn't the nicest of beaches and was quite dirty. The sea was lovely though and we could see what looked like Turkey in the distance. We went for walk down the beach sidewalk and there was like a mini fort which looked like an army look out point. On the route back we stopped at a supermarket and got some milka chocolate (my fav). Later on they did another pork BBQ dish for dinner which seemed to be their favourite meat. Later on we played air hockey and Rich won this round. They did a kids disco every night at 8.30 and then they did karaoke. This was one holiday where there was a large vast range of different nationalities, he must have called out about 10 and there were cheers. There were only a couple of other groups of English people which was strange for a holiday! This meant for the singing, we didn't know many of the songs. The English holiday rep Mark did a version of The Beatles, Strawberry Fields Forever and he ruined it, he even apologised to us after, Ha! He was a nice guy and had only been out there for a week or so before and was only doing it for a month with his girlfriend, they were on a post Uni gap year. We stayed for a little while but after that we had seen and heard enough of the singing. On Wednesday Rich got up at 6.30 to go put our towels out to secure a sunbed (it was an annoying part to the holiday for him) but otherwise you wouldn't get one. When we got to our sunbeds Rich was adamant our towels had been moved by the people on the right hand side. I asked them but they said no, they were Russian. I was just miffed that people would move our stuff but later Rich confessed they could have moved two sun loungers across beside ours! Awkward!! We did our usual lunch routine and after went to get an ice cream, I had a snickers ice cream (haven't had one for years). After dinner we went to the bar and I tried a Mythos beer. I beat Rich at air hockey that night (yes!!) They did a Greek night and encouraged the crowd to get involved and dance with them but we were boring and stayed put. It was jolly enough and they handed out ouzo to the crowd, I tried one and it was so strong! It was a nice bit of entertainment for the evening. There were 4 older English people behind us and we heard Mark the rep talk to them saying about his girlfriend the other rep. The man said 'What the big fat one', we couldn't believe he had said that to him. I guess that's old people for you. On Thursday, we had another pool day and I attempted to practice my diving which was awful. I had a knack for curling up my legs rather than stretching them out so it ended up being a belly flop! We went for an ice - cream from the shop and I got a big cornetto which was lovely, I haven't seen some of these ice-creams in the UK. In the water polo match there was a large Polish family and they got very competitive (splashing each other and really physically restraining each other) which was funny to watch. Later in the day we moved our chairs over to the area where the sun moved around to. There had been 4 older English people sitting in the same area but kept going off to the bar. When we moved over they weren't at their chairs and we weren't really close to them. I heard the guy say something to the woman about us not being there earlier, I think she said 'they moved as the sun will come around here' he said ******ers' in a high pitched voice, was so rude they obviously thought we didn't speak English. I was too shocked to say anything but also they looked a bit rough so they could punch you so probably best not to say anything. After dinner we went to the bar and had a beer and picked up another 6 bottles of water. We joined in with the bingo game that night but didn't win anything (the guy who did was so happy, he was running around high fiving everyone) and went to play air hockey (I won). We then went to book a hire car for the Friday and paid 20 deposit. It was pretty good, 40 euros and we had to replace the petrol used. They then had a men vrs woman night which we watched from our balcony and they had to do drinking games, pass playing cards to each other without the use of hands and retrieve clothes from people in the audience. The women won and they all had to drink ouzo, the men got a massive glass of it as the loser's prize. On Friday we got up and had our breakfast ready to pick up the car for 9am when they opened. We paid the extra 20 euros then headed off. 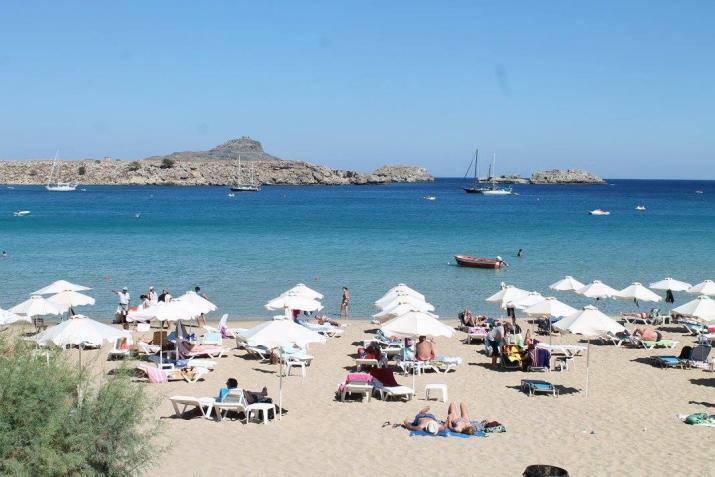 The lady had recommended we stop at a beach called Tsampika Bay as well as head to Lindos. We set off and headed on our route and went pass Faliraki. After about an hour or so we made it to Lindos. The drive was quite coastal so was pretty. We parked up on the side road, the lady had told us you could park on white and blue lines but not on yellow. We went onto the beach and it was beautiful, it was in a little cove area with restaurants set off the beach. It wasn't too busy when we got there about 10.15 and we settled ourselves onto some beds. Later on we paid 10 euros for those. The sea was absolutely stunning, it was nice and calm and really shallow so you could go out quite far. There were some boats a bit further out but it was really peaceful, to our right there was another little beach in the far right hand corner and little houses in the hills. At the top there was a castle which was really pretty. We stayed on the beach and went for some lunch in the restaurant near us. For lunch I ordered calamari and a kebab with a milkshake. Rich had dolmades and a pita gyros and it was nice but quite pricey and cost us 47.50. It took a good part of an hour and a half which was a serious waste of sun tanning time. We left there about 4.15 so we could either go to the castle or go to Tsampika Bay and it was starting to cool a bit as the sun went behind the building. After we left we realised we probably couldn't do both spots so we decided to go check the beach out on the way back. On the way back we stopped at a look out spot which looked down over Lindos and the castle in the backdrop and was stunning. There was another few look outs so we stopped at those as well. We then got to the beach and it was very random, it was a bit like something out of mad max very derelict and tucked away. It was quite a big beach so we went for a wander to the left and Rich went up a massive sand dune. I carried onto the end and when I climbed up it was a little wooden area and people were sitting in there almost like a mini shack. I jumped back down and then climbed up the big sand dune to join Rich and take some pics as it was really pretty. We then went for a wander in the other direction. We went most the way down and there were little restaurants on the beach and in the far right there was a nudist beach but we didn't walk that far, it was getting close to sunset so there wasn't many people left. We saw an abandoned water slide as well which was filled with rubbish. After we walked around we then got in the car to head back. On route back we took a left too early so ended up going through the mountains which definitely made the scenic route. We got back about 7.30ish and went to get some petrol but it was hard to know what to fill it up with as it wasn't full when we left, Rich started with 10 but we were still short so we added another 2 and still looked short so put 5 in and then was way over what we had to put back in. The petrol attendant said it is annoying as most car hire companies don't rent them out full so it makes it hard to know what to put back in. We got back to the hotel and had a quick shower before we went to get some dinner. I was happy we had taken the day trip as it was definitely worth it. Rich won the air hockey that night! On Saturday, it was the last day for the entertainment team to be about so I did some morning stretches which were ok but not great and instead of being 15 minutes were probably about 35 mins. I was going to do the water aerobics but there wasn't many people doing it so felt a bit self-conscious so didn't take part, I opted to continue with my book. I managed to blag a free ice cream from the bar for me and Rich as part of the all-inclusive J For dinner, it was the best feast of the week. They had calamari which was lovely. In the BBQ they did pork and a pasta with ouzo in it which was really tasty, some people were so greedy as we had to wait for them to cook the meat and you normally got 2 pieces each but some people took 4 or more and they did it a few times (some people have no manners) They also had a stand where they were making fresh doughnuts. It was definitely the best buffet of the week! Later on we played air hockey and Rich won this round. Sunday was our last day but at least we had a full day! We made the most of our day by the pool. We took a cheeky sarnie from the breakfast and put in the fridge to have later when we checked out. I spent some time practising my diving which wasn't much better but Rich took videos to show what I was going. I probably only did 1 or 2 semi dives out of about 10 goes. I didn't straighten my legs so kept belly flopping. It was another lovely hot day for us so was good and I got us another ice cream cheekily! When the sun was totally gone we went around and took some pictures of the hotel before we went to use one of their rooms to have a shower. We then went to a nearby restaurant for dinner called Zebranos. I was pretty greedy and had stuffed mushrooms, halloumi and chicken stifado. Rich had a Greek salad and a Greek plate which had a mix of items on. I also had another milkshake which was nicer then the first one I had. It cost another €47.60 so eating out was fairly pricey. When we got back to hotel we sat in the bar as our pick up wasn't coming until 10.05. We played our last round of air hockey and I beat Rich so I went out on a high and we were even!! When we got to the airport there was quite big queues as lots of flights were leaving but we got seen quicker than Gatwick. When we went through to the gates there was nothing to do on the other side so we just got some water and waited to go. It was quite a late flight, it was 1am leave and we would land in Gatwick for about 3am. I was knackered so ended up sleeping most the flight which was good. I had woken at 5ish that morning and on the whole hadn't slept the best all holiday so this made up for it. When we got to Gatwick passport control wasn't too bad and our bags were out quite quickly so that was a blessing and we headed home. As we knew we were coming home to no bathroom we made a quick stop at the service station and got to bed at 4.30.